Railay Beach—also frequently referred to as Rai Leh or Rai Lay—is a small peninsula just south of the town of Ao Nang, Krabi. It’s attached to Krabi’s mainland, but cut off by towering limestone cliffs from all the roads and towns. This isolation from the mainland, and the complete absence of cars and roads, gives Railay Beach a very island feel. 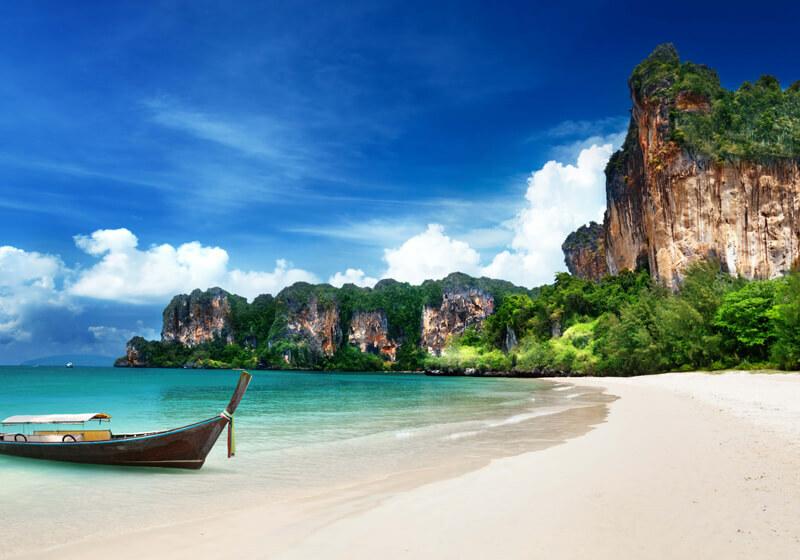 This idyllic beach setting attracts thousands of visitors every year, and Krabi is famous around the world with rock climbers for the stunning limestone rocks on Railay and neighboring Ton Sai Beach. There are three sides to the Railay Beach peninsula. West Railay Beach, also called Sunset Beach by some, and Phra Nang Beach on the south-facing side of the peninsula, are among the best, most stunning white sand beaches in Thailand, surrounded by beautiful emerald clear water. The resorts and hotels on these two beaches are more expensive, but there are also cheaper hotels and bungalows available on the mangrove-lined East Railay Beach, within around 10-15 minutes’ walk from the main beaches. You can spend a relaxing day lazing by the pool or on the beach. Or if you’re looking for more adventure, you can try rock climbing with some of the best instructors in the world. There are many local climbing schools that can outfit you with climbing shoes and equipment, and lead you on trips for everyone from beginners to advanced climbers.